As a Doctor of Children’s, I have recently seen some measles affected babies. Measles is a highly contagious disease. Bangladesh is an overpopulated country. Especially in a slum area and in low socioeconomic condition peoples are living in the congested environment. Also, measles has links with immunity. Measles can easily attack in a reduced immunity condition. Children’s living in these areas have low immunity and undernourished. As a result infectious diseases are more common among them. Bangladesh has adopted EPI program. This program has Measles vaccination along with other vaccines preventable disease. Because of a tremendous success of the Extended Immunisation Programme across the country, the number of infectious disease patients has decreased over the years. Still, Measles is not rare. Measles is a highly contagious disease caused by Rubeola virus, an RNA Paramyxovirus and is characterised by a cough, coryza, conjunctivitis, fever and a distinctive maculopapular rash. Babies get measles virus by airborne droplets. When an affected baby sneezes or coughs, tiny droplets containing the virus spray into the air. The viable virus may be suspended in the air for as long as 1 hr, or on a surface. If your baby comes into contact with these droplets, he can become infected. Portal of entry: Respiratory tract or Conjunctivae. Patients are infectious from 3 days before to up to 4-6 days after the onset of rash. Means your baby must be kept isolated during this period. Measles consists of 4 phases: incubation period, prodromal illness, exanthematous phase, and recovery. Measles Rash appears on the 4-6th day of fever, and with the peak of fever. The erythematous maculopapular rash starts from behind the ear, spreads in the cephalocuadal direction to the extremities in 3-4 days and fades in 3-4 days leaving desquamation. Severe complicated measles: When children with measles having any general danger sign (convulsion, lethargy/ unconsciousness, inability to drink/breastfeed, vomits everything) or deep and extensive mouth ulcers or clouding of the cornea. Measles with eye or mouth complications: Children with less severe measles complications’ such as pus draining from the eyes (a sign of conjunctivitis) or non-deep and non-extensive mouth ulcers. Measles: If children come with measles or history of measles within last 3 months, but having no complications of measles. There is no need of any special drugs. Antibiotics are not necessary unless there are any secondary infections. Only supportive treatment is given. Antiviral therapy is not effective in the treatment of measles in otherwise normal patients. Antipyretics such as Paracetamol can be given for comfort and fever control. Tepid sponging with lukewarm water may help. Gently clean eyes with a warm, damp cloth. Cough medicines rarely relieve a measles cough. Gurgling with lemon or tulsi water may help. Oral rehydration is necessary. Plenty of fluids should be taken. Measles infection in immunocompromised patients is highly lethal. Developing countries such as Bangladesh has vitamin A deficiency. In the USA, 22-72% of children with measles had low retinol levels. In children with signs and symptoms of vitamin A deficiency, a 3rd age-appropriate dose is recommended 2 weeks after the 2nd dose. Patients shed measles virus from 7 days after exposure to 4-6 days after the onset of rash. So keep your children’s away from a susceptible measles case. Immunocompromised patients with measles will shed virus for the duration of the illness, so isolation should be maintained throughout the disease. 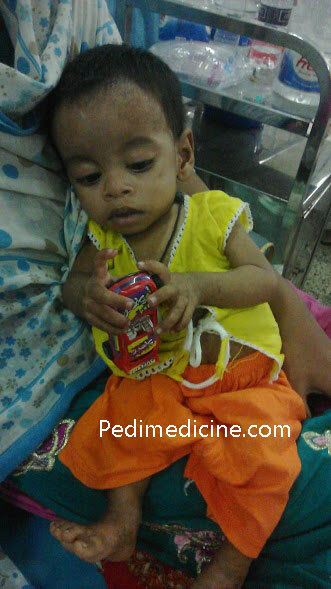 This baby had Severe Acute malnutrition with Pneumonia with Measles. He was treated in Dhaka Medical College Hospital for about 1 month. followed by a 2nd dose at 4-6 yr of age. For children who have not received 2 doses by 11-12 yr of age, a 2nd dose should be provided. Infants who receive a dose before 12 months of age should be given 2 additional doses at 12-15 month and 4-6 year of age. of measles with a delayed onset and an outcome that is nearly always fatal. All cases of infectious diseases are treated in Infectious Disease Hospital which is situated in Mohakhali, Dhaka. This hospital is commonly known as “Saat-tola Hospital” among locals. All cases of measles are referred to this The seven-storey Infectious Diseases Hospital (IDH) hospital for treatment and immunisation. How contagious is the measles? Ans: Highly Contagious. What do Measles look like when they first appear? Ans: Fever andRash with a cough, runny nose and conjunctivitis. Are the measles itchy? Ans: May or may not. Give Antihistamin or Histamine Syp for itching. How long does the measles last? Ans: Usually 7 to 12 day. How do you test for measles? Usually not needed. How do you cure the measles? Only Home treatment. Why should my child get the MMR shot? It prevents 3 fatal diseases. Why shouldn’t you? Is the MMR shot safe? Yes.